I was talking the other day with a young Ukrainian physicist and all-round intellectual type about the 10-minute dead space (hidden track) on An Awesome Wave, the excellent 2012 debut album by the English indie-rock band, Alt-J. I thought the album brilliant, strong and subtle in its aesthetic, but I don’t like dead space. It is conceptually an interesting design idea, but it loses its novelty value after a few iterations and becomes gratuitous. 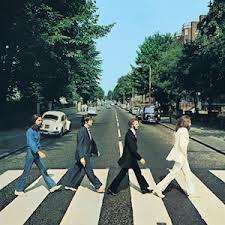 The dead space at the end of Abbey Road, on the other hand, not only had the full novelty value, as the Beatles were the first to deploy the technique, but the entire structure of the album bends toward and justifies that 15-second hiatus, the dead space, the black sign of mortality, between “The End” and “Her Majesty.” (“Her Majesty” was not listed on the original cover or record.) Bear with me as I try to execute this analysis without reference to the “Paul Is Dead” conspiracy theory that swept across pop culture during the month that Abbey Road was released (September 1969). Back when you had LPs with 2 sides, Side 1 of Abbey Road (songs 1-6 on the CD)* gave us an almost archaeological journey through genres, from cool, edgy “Come Together,” to the reflective love song (“Something”), to the bouncy, pub-sing-along sound of “Maxwell’s Silver Hammer,” to the 50s-ish, doo-wop “Oh Darling,” to the child-friendly “Octopus’s Garden,” to the heavier, hypnotic rock and jazz counterpoints of “I Want You (She’s So Heavy).” We also get a panoramic landscape of the Beatles’ sensibilities on this side, with songs by John, George, Paul, Paul, Ringo, and John, respectively. The white noise that encroaches upon “I Want You” at the end of Side 1 might in some way foreshadow the black space at the end of Side 2, but it is really not until Side 2 proper that transitional spaces become blurred. The first song on this side (#7) is a beautiful acoustic with clear edges and clean finish. The transition from #8 to #9 is normal, except that #8 ends in the middle, not the end, of a musical motive, so we’re “waiting” for #9 in that miniscule gap between them. The move from #9 to #10 is a tiny bit more porous, as the edges are bridged only by the continuing sound of crickets. Then the medley begins in earnest, and remaining songs are really movements within a single whole. Thematically, with “Golden Slumbers” (#14), the clouds begin gathering at this, the final moments of the final album recorded by the Beatles (although Let It Be was released later). The final sequence of “Golden Slumbers – Carry That Weight – The End” sounds like a Beatles’ farewell, comparable to Prospero’s epilogue in Shakespeare’s final play, The Tempest. The voice in “Golden Slumbers” raises two possibilities: either it is a soothing lullaby to a small child (go to sleep now and you’ll wake up to smiles) or the last rites to someone dying (let yourself drift into sleep and the angels will greet you when you rise). In context, the second interpretation makes better sense, since the song is drenched in melancholia and pitched to one who might share in the lament that “once there was a way to get back home,” who might recognize that closed path as a weight to be carried across the next passage, the weight of all that loss, the weight of mortality. This is, after all, the dying moment of the Beatles, the cracks of the breakup filling in with nostalgia for the heady days when as teenagers they changed the trajectory of cultural history, relief to get away from it all, hoping that some smile will greet them when they wake up. “Carry That Weight” weaves back in musical motives from earlier songs — most notably, “You Never Give Me Your Money” — and we can now look back and see that beneath the surface strand of Beatles “celebrations” and “negotiations,” there is a hidden strand of “breakdown[s]” and missed connections. With “Carry That Weight” behind us, we get an exuberant guitar interlude, a burst of life, a sense of relief and liberation from the heaviness – we are witnessing not just a death but an archetypal death-and-rebirth pattern, a sonic anticipation of breaking the shell of those golden slumbers, breaking from death to rebirth. Then the guitar burst mellows into a mystical conclusion, a final couplet (a perfect iambic tetrameter couplet if you read it as it would be read from a poetry book) that summarizes the 8-year dream of the Beatles, with a few potent words and a sudden orchestral gravitas. Finally, it’s hard to listen to Abbey Road and not ponder that sometime between 1962 (when Elvis Presley’s “Return to Sender” was the #1 song of the year) and 1969, an enormous paradigm shift had taken place and the era of music we now live in had begun. The Beatles not only mark the beginning of this era but, to a larger extent than anyone else, invented it. I like to see the Nirvana song, “Come As You Are,” consciously or unconsciously, as Kurt Cobain’s memoriam (or rather “memoria” since the ambivalence doubles all values) to John Lennon. Many references are left vague in the song, but some things we can say we know. We know that he is addressing someone whose fate seems to have entangled with his own. He feels intense ambivalence toward that someone – an old friend and enduring enemy, and inspiration and a curse. He wants to arrange a meeting with this person and is torn between intense desire (“hurry up”) and intense reluctance (“take your time”) for the meeting. He feels the need to assure the person that he doesn’t have a gun, which makes perfect sense since the last time Lennon faced an obsessive worshipper/enemy whose fate was entangled with his, we all know what happened. But he may be doing more than pleading for soul-to-soul contact with Lennon, and assuring Lennon that his intent is not to shoot him like the last guy did. Considering that Cobain shot himself in the head three years later, he may have already had occasional suicidal feelings, and may have been assuring Lennon that the meeting would not lead Cobain himself to break down and commit suicide. This would have satisfied several unconscious needs at once: (1) the need to scoff at Lennon’s arrogance, (2) the need to express the magnitude of awe Cobain felt for Lennon, (3) the need to sublimate his own suicidal impulses into a concrete relationship – in this case his emotional dissolution is tied to the crushing ambivalence he, as a man defined by his musical creativity, had toward John Lennon. Regarding the “doused in mud, soaked in bleach” lyric, I know it came from a needle exchange program slogan, and has led some to conclude that heroin is the “friend and enemy” of which Cobain sings. Of course the song could work on multiple levels, but it makes just as much sense to say Cobain saw the slogan and it resonated with his feelings about Lennon – whom he’d love to see come to the meeting dirty, ragged, deflated, exposed as someone who shits and pisses like the rest of us, but whom he also idealizes into a bleached white angel. If one were to apply the Freudian schema of id, ego, and superego to the rock spectrum of the late 60s and 70s, Led Zeppelin would be an obvious candidate for the id. From the ominous chord progressions of Kashmir to the haunting Robert Plant vocals, Zeppelin’s sonic universe expresses in every nuance the power of the dark drives that animate the human psyche. By contrast, the Beatles symbolize the superego, crystallizing in song after song the ideals and aspirations of their generation. If one had to pick an exemplar of the ego in this schema, offering tales of everyday grit and grind where the rubber meets the road, Bob Dylan would cast fine in that role. Led Zeppelin lacks both the street cynicism of Dylan and the idealism of the Beatles, but that vacuum is more than filled with the powerful rhythms of the id. Even when Zeppelin ventures into the zone of idealism, the zone of the superego, it is engulfed by the dominant passion of the id. “Going to California,” for example, presumably a paean to that icon of hippie ideals and author of the song “Woodstock,” Joni Mitchell, starts out with Jimmy Page’s gentle guitar notes, with Plant’s contemplative tone and lyrical “aching” for the ideal. But Plant cannot survive in these waters, and the vocals pitch from pensive to agonizing quite abruptly in the second stanza, like some irresistible return of the repressed. Plant is self-possessed enough to know he has crafted a song that takes him out of his element, and he cries out to anyone who can hear: “I think I might be sinking … throw me a line.” Zeppelin knows that if they wander too far from the land of the id into the land of sentiment, they will drown. And from that knowledge comes their musical power. The Beatles, in fact, work the opposite way, starting with a vast array of songs that partly capture and partly create the hippie zeitgeist, with “All You Need Is Love” and “Revolution” as perhaps twin pillars of this thematic layer. When they venture into the subject matter of the id, say via the amoral meaningless violence of “Maxwell’s Silver Hammer,” the sonic universe keeps us in the idealized realm. Despite the lyrics, it remains playful, bouncy, rich in sheer aesthetic pleasure. We’re as upbeat about Maxwell’s murderous rampage as we are terrified by Led Zeppelin’s love song. The Beatles weave every dark thread into the visionary tapestry of the superego, and Zeppelin pulls everything back to the id. A final conclusion of this schema is that the Beatles are the only real “hippie” band of the three. Bob Dylan is pure Beat Generation, as epitomized by the cynical, street-bound, gritty realism of “Tangled Up in Blue.” I suspect he was a little distrustful of hippie idealism, and would be more at home among the black-leathered coffee shop poets of North Beach. Donovan might take the same folk meters and acoustic-harmonica instrumentation as Dylan and transmute it into something like “Catch the Wind,” a beautiful, dreamy soundtrack for the motley-colored flower children of Golden Gate Park. (And Donovan brings a Jungian dimension to our schema, with songs like “Hurdy-Gurdy Man” and “Atlantis” rummaging through the collective unconscious for Messianic forces to usher in the Age of Aquarius.) One can even picture solid Beat icons like Lawrence Ferlinghetti and Allen Ginsberg roaming freely among those bell-bottomed waifs of Golden Gate Park. But not Dylan. He remains a creature of the ego. “When the Levee Breaks” for Led Zeppelin, on the other hand, all hell breaks loose from the depths of the id. “In the Evening,” one of the last songs before John Bonham’s death, echoes the hypnotic quality of Kashmir, dragging the listener into the rhythm of the band’s own compulsions, as the main riff continues to pound in the mind after the song is over. Even in the famous excesses of their touring lifestyle, Led Zeppelin was always something other than hippie, other than Beat, something dark and primal, something to which, for better or for worse, we can all relate.